This movie tries to give one simple message and that is not to ignore people who are different from you. The plot is about a teacher searching for jobs and even though she is good at what she does, she is not hired. The reason being, that she has Tourette’s syndrome. When she finally finds employment she is given charge of a rowdy class. With much difficulty she figures out that the reason these children are rowdy is because they’re excluded and made to feel inferior because of their economic background. Hence the journey for recognition starts with the teacher and students find support in each other. The movie is successful in putting across the message how it’s important to be included and what being segregated on various grounds does to a psyche of a person. 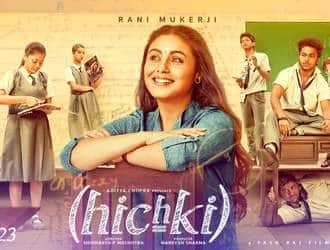 The film Hichki marks the comeback of Rani Mukherjee. She plays the role of a woman who suffers from Tourette syndrome, and who wants to be a teacher. Naturally, due to her condition, she is rejected by majority of the schools until one school finally keeps her to teach the “most ill mannered class”. Then follows the very cliched plot of a bunch of rebel kids who at first resist their teacher(Rani), but later gel with her after she manages to win them over. Perfect blend of emotions, laughter, following your dreams and more! The movie Hichki is a delight to the viewer’s eyes.It creates a nostalgia for all the viewers transporting them to the vivid memories of their school days while it also teaches us to follow dreams that we’re passionate about unendingly and live life with a smile and a never give up attitude. It also teaches us to not let our disabilities define who we are. Look back in time when you were in school and try to grasp the most favourite memory. There are many, right? We miss almost everything about school since school is that one place where we didn't hold ourselves, where we learnt that nothing is impossible and learnt the actual meaning instead which says, I'M POSSIBLE. This is the focal theme of Hichki, around which the characters revolve. Living in a society that makes syndrome and darker aspects of life a taboo, the movie has tried to incorporate this very theme of I'M POSSIBLE in everyway by showcasing these two different dimensions dealing with the lives of characters where the teacher ( Rani Mukerji) deals with the speech defect and children belong to the underprivileged section of society. The audience is delighted to watch Rani Mukerji in and as Naina Mathur on screen after four years in an iconic role where she's not only seen portraying a teacher having a tourette syndrome but also giving a very important social message. After being rejected several times from schools beacuse of her syndrome she finally gets in St. Notker's where she gets to teach a group of students who belonged to slum. Apparently, children try to swipe away Mathur in everyway possible but she turns everything around by her image of teaching- which is innovative and engaging! Writers, Siddharth and Ankur Chaudhary have done tremendously well. Script and dialogue delivery is central subject. The dialogues are sharp and engage the audience's attention as it has portrayed the determination of a teacher and her students in an unacceptable world. Naina Mathur abruptly says, "There are no bad students, only bad teachers." The dialogue here clicks and moves our attention to those children who in society are willing to work hard and excel but because of the unaccpetance they are today entangled in a world full of lies. Towards the end of the movie, Naina Mathur and her students succeed in setting a bench mark for all those whole bullied them and successfully conveyed the message that everything is possible in this world. The unaccpetance will one day change in acceptance and that is what the climax is all about, the children of slum grew up and become successful in their fields where as Mathur is seen as an inspiring principal of St. Notker's.